Episode 12 of OTPWR places us in Austin, Texas. We stayed at a KOA on the east side of the city in a more rural setting. We found Austin to be an inviting city to walk around with most of its attractions perfectly situated within walking distance of where we could park our big truck Hagrid. Our fist evening down in town was to try and catch the thousands of bats that nest under and fly out from under the Congress Ave bridge. The bats don’t fly out to eat every evening, but we were happy to have them perform their show when we were there. We also walked around the downtown are and arrived at the Capitol building just in time for a tour. The building is beautiful and has a very interesting history. We happened to be their the day following President George Bush’s passing. That set a bit different tone for this experience. After the Capitol building, we walked south to meet up with my Aunt Judy who lives in Austin. We had arranged to meet at the famous Amy’s ice creams. On the way, we detoured so we could find the Stevie Ray Vaughn station perched on the path along the Colorado River (Not the same Colorado river we are used to crossing in Colorado mind you). The walk and Amy’s were both enjoyable. The area of South Congress is a fun place to visit and hang out. Check it out when you’re there! We also took an evening to try and improve the Christmas spirit in this warm climate by visiting the holiday lights display at the Circuit of the Americas. That was a nice evening of strolling the racetrack grounds with lights from various cultures set up in beautiful displays. We had a great time in Austin and certainly recommend you put it on your list of destinations while on the road! Enjoy and please SUBSCRIBE and click that bell to be notified when we upload new videos each week! We would love to hear from you, so take a minute to let us know what you think in the comments below. You can also follow us on Instagram and Facebook at “Oh the Places We’ll Roll”. 👍Please consider becoming a Patron of Oh the Places We’ll Roll at the link below. Thanks for watching and stay tuned for next week’s video where we poke around San Marcos, Texas on our slow journey to warmer weather on the gulf coast. At least in Austin, Texas ☀️ So we're making the most of it by heading to Barton Springs,… Austin Travel Travel Vlog- Our Trip to Austin Texas!!! 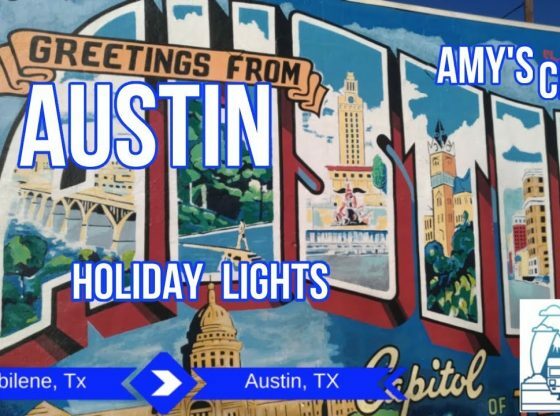 OTPWR Ep 12 - Austin - Bats - Holiday Lights - Stevie Ray - TX Capitol - Full Time RV Family Travel - Duration: ... STORY TIME !! MOVING TO AUSTIN TX NEW FRITO LAY JOB! !